Digital cameras can be a difficult choice due to the plethora of characteristics to think about. Between Nikon Coolpix AW100 and Sony Cyber-shot DSC-TX20 are matched especially when it picks for shutterbugs and photographers. 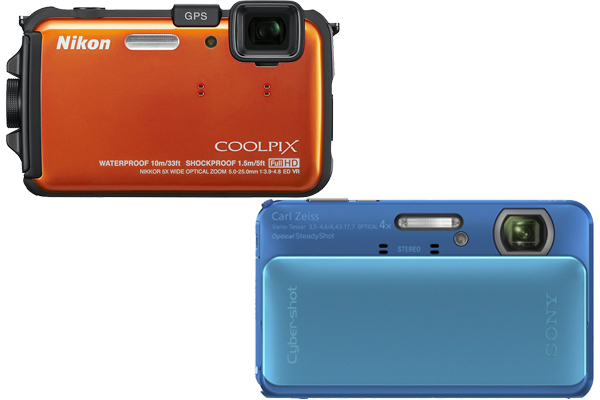 The Coolpix AW100 vs The Cyber-shot DSC-TX20 gets many reviews because they are often being compared. We will do the same in this following below. This camera is capable of use in water to a depth of 10 meters, withstand shocks when falling from a height of 1.5 m, and still operate in a temperature of-10 degrees Celsius. All this toughness is manifested in the shape and design of the Nikon camera that is thin and light. The body has a thickness of only AW100 0.9 inches and weighs 6.3 ounces. Coolpix AW100 was equipped with a variety of technologies from Nikon NIKKOR ED Lens, such as 28-140mm with 5 x wide angle zoom and Vibration Reduction (VR) to reduce the effects of camera shake in the photographs were produced. The camera is also equipped with a BSI CMOS sensor 16 megapixel resolution that able to used to record 1080 p HD video. EXPEED image processor C2TM that were presented in the camera it helps produce high quality images. Because it is designed for the adventurous, the Nikon Coolpix AW100 is equipped with a GPS function that records the location of shooting places to a height of. Users can view the data through software Nikon ViewNX2 photo-sharing sites, Nikon, or Google Earth. Take a look: Nikon Coolpix AW100 vs. Panasonic Lumix DMC TS4. Sony Cyber-Shot DSC TX20 is a waterproof camera with charming designs. In addition to presenting the resolution 16.2 MP as well as a wide 25 mm lens coverage, this tough camera has the ability to take picture underwater to a depth of 5 meters, hold the fall from the height of 1.5 meters, dust-resistant and resistant to cold temperatures up to temperatures of-10 degrees Celsius. Sony DSCTx20 has a CMOS sensor Exmor R resolution 16.2 MP who was able to increase the speed of the auto focus, low-light performance, image stabilization, a blur effect, 3D and photo multishot to 10 fps. This camera uses a lens with a range of 25-100 mm or 4 x optical zoom. In addition to the performance of high sensitivity to conditions less light, DSC TX20 also has the unique ability with the feature “dual record”. With this feature, you can take pictures up to 12 MP resolution while recording video. The video resolution is also already Full-HD (1920 × 1080 pixels) and to keep image does not blur, this camera also features an Optical SteadyShot level that can be used for photos and videos. As well as 7 Picture effect on this camera that makes underwater photography more fun through your creativity. Overall, the Cyber-shot DSC-TX20 from Sony has a 1% greater sensor resolution, it allows you to create bigger image enlargements with more detail. The Cyber-shot DSC-TX20’s also has 33% lighter weight helps you hold it more easily during extended photo sessions. In other condition, the Coolpix AW100 from Nikon boasts a 25% larger optical zoom, so you can capture greater detail from a distance and your Coolpix AW100 does well with a large screen size. Consequently, the Coolpix AW100 is great for wildlife photography.